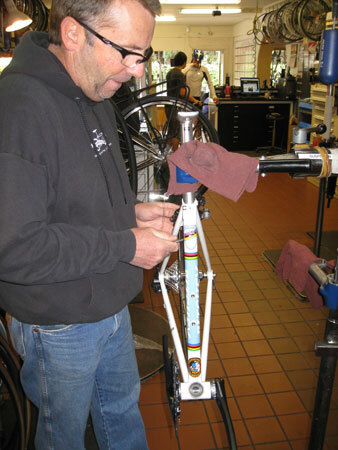 Dave Prion explains how tight to crank the two seat post bolts on the Ritchey Break-Away. The frame comes apart at the seat tube for easy breakdown and transport in a soft travel bag, which comes with the bike, as does the Ritchey headset. I heard about the bike several years ago and remember watching the video on assembly and disassembly. It seemed interesting at the time, but I wasn’t in the market for a new bike. It turns out Dave Prion, manager at Bicycle Outfitter, and cycling commentator Bruce Hildenbrand also ride Break-Aways. I decided to take the plunge. My past 24 years was spent riding the same road bike, built by Dale Saso, and using ancient Campagnolo parts. I was ready to join the 21st century. I could have had a bike custom-built, but the Break-Away intrigued me, not only for the transportability, but also because I wanted to try a carbon-fiber fork. The original Break-Away came with a steel fork, but now uses a carbon-fiber fork and steer column. The rest of the bike is steel with fillet-brazed joints. I debated using a steel fork, but decided to see if carbon-fiber would hold up and if the ride was noticeably different. After buying the bike at Bicycle Outfitter I settled on Shimano Ultegra components and Shimano Ultegra hubs with Mavic Open Pro 36-hole rims. I chose a 50-34 chainwheel and 11-25 freewheel, which gave me a wider range of gears than I had on the old bike (52-42 and 14-24). Once I had all the parts and bike, Bicycle Outfitter kindly let me assemble it in their shop, although Dave and shop mechanic Kenny Ellis did almost everything. I could assemble and disassemble my old bike, but this was all new technology and I had no clue. I would not recommend doing assembly yourself, especially when it comes to the headset and steer column sizing. I had to be fit for the bike and after 20 years living with the same setup I was due for a major change. I needed a much shorter, higher stem. This change is mostly due to old age. The carbon fiber fork needs to be cut and while it’s easy to cut with a hacksaw, you need to know exactly what length the fork column needs to be, which depends on the type of headset and how high you want your stem. The worst thing that could happen is to cut the column too short. Carbon-fiber forks use a unique clamp in place of the star nut found on threadless headsets with steel fork columns. Understanding how this works is important to maintain the carbon-fiber fork’s integrity. This entry was posted on December 4, 2011 at 2:03 pm and is filed under Products. You can follow any responses to this entry through the RSS 2.0 feed. You can leave a response, or trackback from your own site.